Gloucester Road Central traders put on another hugely successful Mayfest over the May Day weekend. 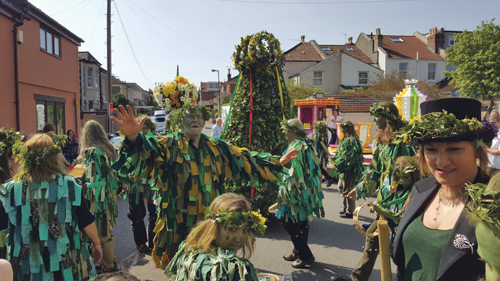 With the sun shining the Bishopston community was treated to a day of food, drink, live music and fun activities. As usual, Joe’s Bakery gave kids the chance to decorate - and eat - gingerbread men, Paper Plane showed them how to make origami animals and Knit Natter Stitch set up outside Room 212 offering free workshops on making May crowns. Osna Therapy hosted a programme of talks from alternative practitioners and offered free massage tasters while Boston Tea Party set up a juice and cake stall next door and musicians entertained the crowds. Billie Jean was back on the street with her Cashmere Event and the kids' shoe sale at OddSox was a hit as always. Avon Wildlife Trust and Riverford organic demonstrated benefits of supporting nature and Jam Plan sold locally produced jams. Babybank held a lucky dip to raise funds and awareness. Preserve Food, a new zero waste shop, set up a temporary stall and sold out of reusable straws and bamboo toothbrushes, soon to be offered in store. Bishop Road was closed off for the day, giving space for a teacup ride, vegetarian cafe, facepainting from Ace Paints and free nail painting from Icon Beauty.